“Most of the movement is timed with the rhythm of the music,” says Katun24, who holds the world record for a blindfolded speedrun of Super Mario World, of the 2D platformer game genre. “Music usually plays a very big role for timing movement accurately.” This is especially true of Mario games, because of how their music was crafted. Koji Kondo, the man who composed the music for the classic Mario games, designs his tunes to do more than just get stuck in your head. His music will also tell you how to play the game, if you listen closely. This connection is not a coincidence. It all goes back to 1985, when Kondo composed his first-ever piece of Mario music—not the iconic “overworld” theme, but the underwater level music. Super Mario Bros. was just the third game that Kondo had ever worked on at Nintendo after he was hired right out of college the previous year. Kondo, a gifted musician and fan of early arcade games, said that the underwater theme was the song that came most naturally to him. It’s easy to hear why when you play the game with your sound on—the song’s waltz-like 6/8 time signature exactly mimics the floaty environment of the water landscape. The overworld theme, however, proved more difficult to compose, mainly because Kondo wanted his music to do something that had never been done before. In an Iwata Asks interview, Kondo stated that in his first attempt at an overworld theme, he tried to write a song whose tone would match the cheery, bright style of the game’s land-based levels. This song failed, however, because he attempted to match the level’s aesthetics rather than the rhythms of gameplay. In other words, his song didn’t convey the feeling of running and jumping that you have when you play Super Mario Bros. Kondo had also been reluctant to create a sound effect for Mario’s jump, since jumping isn’t associated with any sound in real-life. But after playing the game prototype, Kondo knew just what to do. He added the jump sound effect and composed the final version of the level 1-1 overworld song—the bouncy, playful one we’ve all had stuck in our head ever since. Through this experience, Kondo has said he “learned the importance of being able to actually play the game and match the music to its rhythms,” a technique that characterized all the rest of his game soundtracks and one that music scholars have begun to study. Andrew Schartmann, who literally wrote the book on the Super Mario Bros. soundtrack, argues in Slate that Kondo often synchronizes musical rhythms with player jumping patterns, running speeds, and sprite animations (like Cheep-Cheeps swimming in time to the “Underwater Waltz”). This close connection between music and game controls helps to explain why some players can conduct speedruns while blindfolded, just by jumping to the rhythm of the music. Ryan Thompson, professor of practice of video game history at Michigan State University, is a ludomusicologist, meaning he specializes in game audio. He’s presented on the music of Bastion, Left 4 Dead, and Final Fantasy XII. In his free time, he’s found that his knowledge of the connection between Left 4 Dead’s music cues and zombie spawning locations has significantly increased his skills at the game. In his Ph.D dissertation, Thompson studied how Super Mario Bros. 3 speedrunners in particular use the game’s music to keep track of which button to press at which times. “But if I say it’s the ‘and’ of beat two, it turns out a lot of people know what that means,” he said. For his Ph.D dissertation, Ryan Thompson created custom Super Mario Maker levels that were synchronized with the game’s music. Game music, then, can offer a kind of vocabulary and framework for explaining and annotating speedruns. During his research process, Thompson transcribed the Super Mario Bros. 3 level 1-1 theme song into sheet music and then added in an extra “voice”—the button presses from the world-record playthrough. Thompson hypothesized that, with no screen in front of them, a good percussionist could “play” the playthrough beat from the sheet music and finish the level in world-record time. Just watch this video of level 1-1 of Super Mario Bros. and you can see this effect for yourself. If you start moving forward the moment the music starts, then you’ll reach the first question mark block immediately after the level theme’s iconic preamble ends—ba dum bum ba dum DUM, dum. The game seems to want you to hit the jump button at the exact beginning of the next measure, which feels very satisfying to do in time with the music and which—not coincidentally—will ensure that you jump when you’re supposed to, to avoid the Goomba and knock the first block. The music is telling you when to jump. And the player in this video times it perfectly. In a blindfolded speedrun, of course, the music plays more than just a suggestive role. World record holder Katun24 estimates that 95 percent of all movement in a blindfolded speedrun of Super Mario World is timed to the game’s musical rhythms. When there’s no beat, speedrunners just have to drop one themselves. “In some games or levels there is no rhythmic music,” like Portal, he says, “I would continuously shoot the gun, which is a rhythmic sound, and base movement off of that,” Katun24 said. Even in runs where he’s not blindfolded, Katun24 finds himself using rhythmic timing from the game music in places where other runners might use more of a combination of visual cues and muscle memory. This perfect choreography between music and gameplay is common in platform games in particular, according to musicologist Plank. In today’s games, sound effects add depth, atmosphere, and ambience to game worlds. But sound effects in early platformer games tended to fulfill more communicative purposes, conveying important information to the player about the game state. In games that use virtually no text to explain the game’s rules and secrets, music and sound effects provide a key way for the game to communicate with the player about how to play. And it’s not just for speedrunners. That panicky feeling you get when you start running out of time in Super Mario Bros? That’s what Plank is talking about. In many early platformer games when the player runs low on time, the tempo of the music not only increases, but also rises in tone. 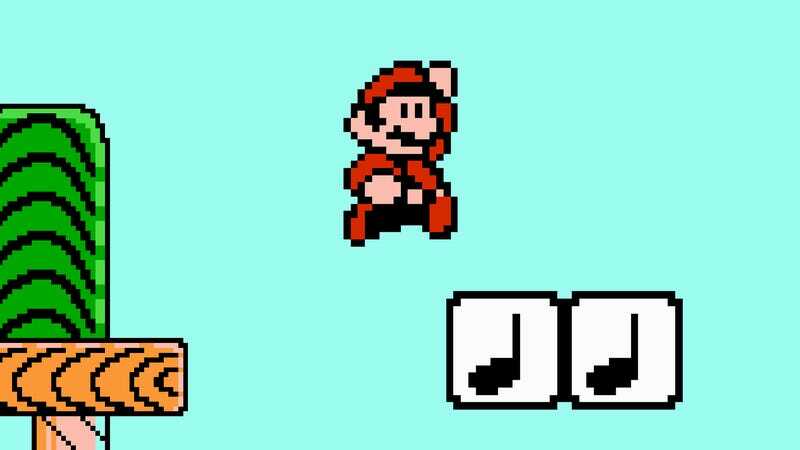 On the other hand, is there any sweeter music to a Mario player’s ears than the one-up jingle?